BBC Sport pundit Garth Crooks has revealed his Premier League team of the week with a strong Liverpool contingent dominating the line-up. Starting with the Merseyside giants, Jurgen Klopp’s men put their nightmare at Wembley against Tottenham last season behind them as they secured a 2-1 win. A significant factor in the difference between the two performances was Liverpool defensively, with Joe Gomez and Virgil van Dijk keeping things tighter at the back, albeit the former did have his moments where he looked a little vulnerable. 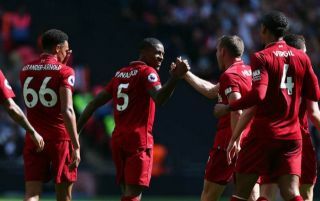 Nevertheless, it wasn’t enough to put Crooks off from selecting both players in his line-up, with James Milner joining them after putting in a hugely important shift to win the midfield battle and give the Reds a foothold in the game throughout. While he may not get all the accolades and headlines, there is no denying how important the stalwart is to Liverpool as the engine room in the heart of the side. Roberto Firmino rounds up the contingent after getting on the scoresheet, while the Brazilian’s absence was obvious after he was forced off with an injury as his pressing and work ethic up front to set the tone for the rest of the side went missing. Crooks also went with several Man Utd stars after their thrilling win over Watford, with David De Gea unsurprisingly getting the nod after making key saves including a late one to secure all three points for his side. Chris Smalling was impressive in defence and grabbed himself a goal too, while Marouane Fellaini continues to do the dirty work and play a key role for the Red Devils, particularly in games like these where he uses his physicality and aerial presence to great effect. Elsewhere, Eden Hazard helped himself to a hat-trick as the Belgian superstar continues to shine under Maurizio Sarri early on with Chelsea continuing to impress and setting the pace alongside Liverpool. His composure and quality in the final third will undoubtedly be crucial to their hopes of winning major honours this season. Bournemouth’s Ryan Fraser also gets the nod after playing a key role in his side’s win over Leicester City, while Wilfried Zaha and Marko Arnautovic complete the XI after scoring for their respective sides to pick up crucial victories. Crooks’ Team of the Week: De Gea; Smalling, Gomez, Van Dijk; Fellaini, Milner, Hazard, Fraser; Zaha, Firmino and Arnautovic. is there a more annoying man in the football world …. just beats lawro in my opinion ! Garth been drinking the fizzing again has he? Stop smoking pots. It probably not good for you. Gomez? Please stop this guy from writing these. He does not watch the games.